Never, ever use a left-hand rule! You may already know that one use of the right-hand rule is to find the direction of the force on a positively charged particle. If you want to know the direction of the force on a negatively charged particle, you use the right-hand rule and then reverse the direction you obtain. Almost every year, I get a student who comes up with the clever idea to use a left-hand rule on negative particles. Does this work? Absolutely! So why is it a bad idea? Because once you’ve used the left-hand rule, you’ve created a muscle memory that says it is okay. And the next time you need to use a right-hand rule, you may pick up your left hand without even thinking about it and you will get the wrong result. (This is particularly true if you are right handed—you already have a pencil in your right hand, so it seems perfectly natural to use your free hand.) You won’t even realize you got the wrong answer. When I teach students the right-hand rule for the first time, I train them to sit on their left hands so they won’t be tempted to use them by mistake. After 10 or 20 times using the right-hand rule, you’ll develop a muscle memory that says “only the right hand will do” and you will be less likely to make this mistake. He taught this method to me, but I think it’s hard to remember which finger goes with which vector. Here’s the technique I think works best: Let’s say you want to find the direction of Point your fingers in the direction of Curl your fingers so that they point in the direction of (Find the smallest angle between and ) Your outstretched thumb points in the direction of the cross product. Note that you may have to rotate your wrist before you curl your fingers so that they will point in the correct direction. Magnetic field due to the current in a wire: When a current travels through a wire, it generates magnetic field lines that form concentric circles around the wire. But does the magnetic field point clockwise or counterclockwise? 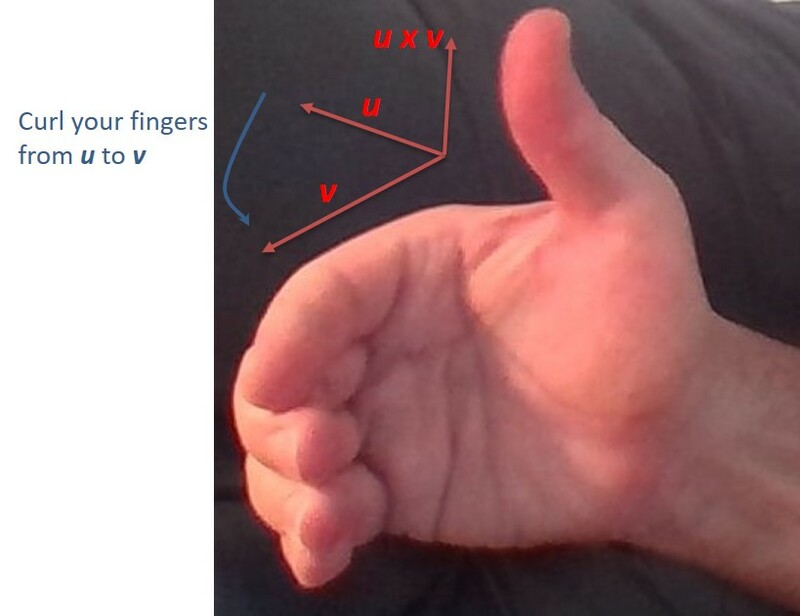 Use the right-hand rule to determine the direction of the field. 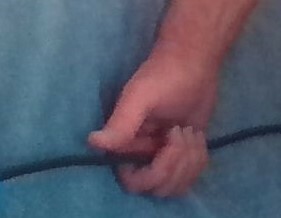 Grip the wire with your right hand so that your thumb points in the direction of the (conventional) current. Then your fingers curl around the wire in the direction of the field. If the wire is bent into a loop, this same method tells you which direction through the loop the field points. In this photo, the current is moving to the left. Point your thumb to the left, and you see the field lines are moving down behind the wire and are moving up in front of the wire. Lenz’ law: When a loop of wire is placed in a location where the magnetic flux is changing, a current is induced in the wire. But in which direction is the induced current? Use a right-hand rule to determine the direction of the current. First determine the direction of the induced magnetic field predicted by Lenz’ law. If the flux is increasing through the loop the induced magnetic field has to point in the direction opposite the flux. If the flux is decreasing, the induced field points in the same direction as the flux. Now wrap your fingers around the wire so that they are pointing in the direction of this induced flux. Your thumb points in the direction of the induced current. 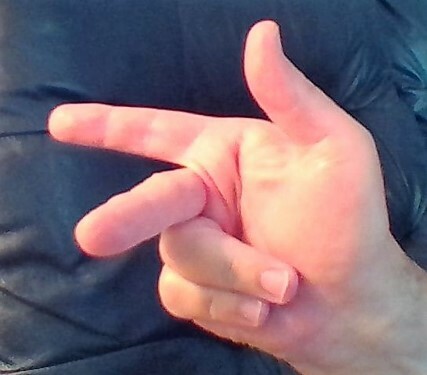 Note that this right-hand rule is essentially the reverse of the previous rule. In this photo, we have determined the induced flux must point out of the page towards our point of view. We curl our fingers to show this direction and we see the induced emf and induced current will be counterclockwise. Ampere’s law: The loop integral around an Amperian loop is proportional to the net current through the loop. But in which direction through the loop is the current positive? Use a right-hand rule to determine the direction of positive current. 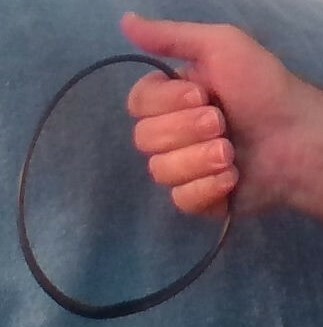 Curl your fingers around the loop in the direction of integration. Your thumb points in the direction of positive current. Our Amperian loop is shown in orange in this photo. 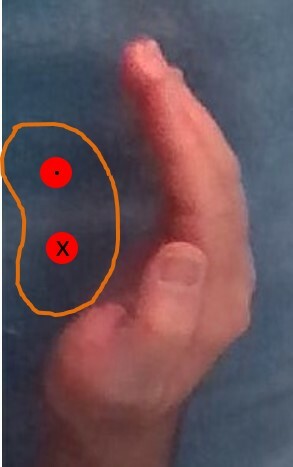 The two red circles represent current-carrying wires. The top wire has current coming out of the page and the bottom wire has current flowing into the page. We choose to integrate in a counterclockwise direction. Curl your fingers in that direction and your thumb points out of the page (towards your point of view). Therefore the top wire will be assigned a positive current and the bottom wire will be assigned a negative current in order to apply Ampere’s law. A common differential equation is of the form . In this situation, the equation can be solved by a technique called “separation of variables”. It involves putting all the y terms on one side of the equation and all the x terms on the other side. Then integration on both sides leads to a solution. Let’s look at a couple of examples. If you’ve read some of my other posts, you know that this requires integration by parts. Let’s get started on it and see where it leads. Now what? Well, the new integral requires integration by parts too! So you go through all the steps again. Then you have to do integration by parts on this result. And again on the next result! It’s tedious, but eventually you get to the correct answer. However, if one of the two functions in the original integral is a polynomial, there is a faster way to do this process. It’s called tabular integration, because all the parts of the integral are found by filling in a table. Make a two-column table, with the columns labeled u and dv. Put the polynomial function (in our example, x4) under the u. Then take the derivative of this function and write it below the original function. Continue taking the derivative until you reach 0. In our example, your first column now looks like this. How does the speed of light relate to Maxwell’s equations? 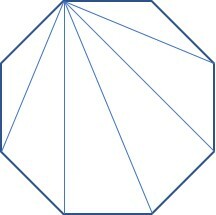 You can see that from this vertex on the upper left, a diagonal can be drawn to every vertex except the two adjacent vertices and to itself. So the number of diagonals from any vertex in an n-gon is (n-3). 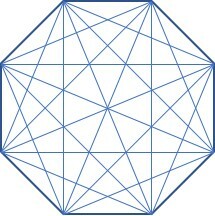 Since there are n vertices, the total number of diagonals is n(n-3). But we’ve just counted every diagonal twice (once from each endpoint), so to find the number of different diagonals, we divide by two. This gives us the formula above. How do you find the measure of an internal angle or an external angle on a regular polygon? It’s quite easy, if you memorize two formulas. All you have to do is count the number of sides on the polygon and plug it into the formula. 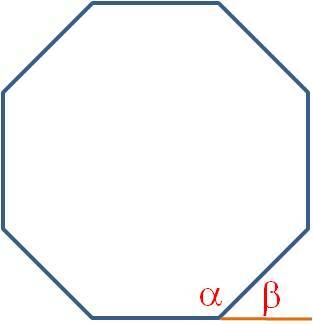 For example, here is a regular octagon, so n = 8. The internal angle is labeled α and the external angle is β. And here’s a trick to save you some time: You can see in the figure that the internal and external angles are always supplementary. (This is true in any polygon, even if it isn’t regular.) So if you need to find the internal angle, you can find the external angle instead with the simpler formula. Then the supplement to that angle is the internal angle!